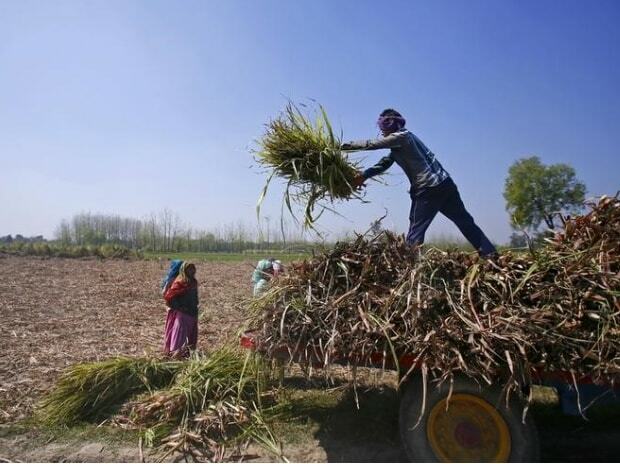 Ahead of the crucial Lok Sabha elections, the domestic sugar crisis perpetuated by piling inventories, global glut and subdued sugar prices has started taking its toll in the key state of Uttar Pradesh. The sugarcane payments ratio in the state has dipped by almost 20 per cent in the ongoing crushing season compared to 2017-18. While, the aggregate sugarcane payments notched up to more than 71 per cent at the end of March 2018, the payments ratio logged massive dip to about 57 per cent in the current 2018-19 season. 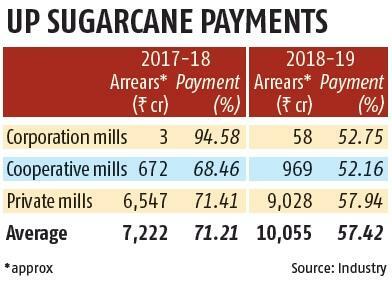 Even in absolute terms, the net sugarcane arrears have piled up to over Rs 10,000 crore on the basis of state advised price (SAP) this season compared to around Rs 7,222 crore in 2017-18. SAP is announced by the state government annually to remunerate farmers beyond the fair and remunerative price (FRP) set by the Centre. Against the FRP of Rs 275/ quintal for 2018-19 crushing season, the SAP UP stands at Rs 315 per quintal, higher by 15 per cent. In fact, the current outstanding is close to Rs 12,700 crore and payments ratio is at 52 per cent. But since the sugar mills get a window of 14 days to repay farmers, their liability is calculated after discounting this period. Interestingly, the payments ratio of government controlled cooperative and corporation mills are lower than the private sector mills in UP. This is despite the fact that the ruling Bharatiya Janata Party (BJP) had come to power in 2017 with the promise of ensuring full payments to the sugarcane farmers within 14 days. Of the total operational 119 sugar mills, the bulk of the units are private (94), followed by cooperatives (24). A few weeks back, UP chief secretary Anup Chandra Pandey had summoned the private millers and directed them to ensure full payments. A private sugar mill official had told Business Standard that western UP mills have been directed to settle dues by the end of March, while the central and eastern UP units have been given time till middle and end of April 2019, respectively. Since, polling in UP would begin from the western region and progress towards the eastern during the successive phases, the ruling dispensation wants to ensure that maximum sugarcane payments are made before voting takes place in the respective constituencies. Meanwhile, sugarcane arrears of nearly Rs 170 crore is also pending on the private millers for the previous 2017-18 crushing season. Against the total liability of Rs 35,464 crore, UP sugar mills have paid around Rs 35,291 crore. Last year, the Adityanath government had even floated a soft loan scheme for the beleaguered private millers. It was provided to mills whose payment ratio stood at more than 30 per cent during for 2017-18, with the eligible units being sanctioned with soft loans totalling a little over Rs 2,900 crore. While, the opposition has been sharpening attacks on the state government over mounting sugarcane arrears, the chief minister has been claiming credit for ensuring total sugarcane payments worth Rs 58,000 crore during the past two years, including the unpaid arrears pertaining to previous crushing seasons. In fact, Adityanath has on numerous occasions referred to the low international sugar prices and export market squeeze for the looming crisis in the domestic sugar sector. He had observed that sugar exports got impeded due to low global price index even as he also recalled the plethora of measures taken by the Centre and UP to support the sector.